Plump, crunchy radishes, a dab of butter, a pinch of sea salt... A simple joy, like so many of the best things in life. These make also a refreshing, peppy addition to salads, slaws and stir-fries. Layer thin slices on rye toast with cream cheese and a generous grinding of black pepper. Or transform them to yielding sweetness by roasting for 20 mins with a drizzle of olive oil. 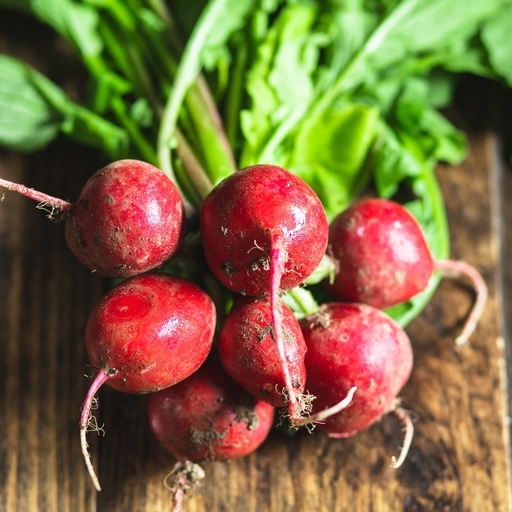 Radishes needn’t only be eaten raw. Cooking softens and sweetens them. Halve and simmer in a pan with brown sugar, balsamic, butter and a little water until tender and covered in syrupy glaze – about 15 mins. Or simmer in stock until tender, toss in butter, sprinkle with fresh herbs and eat as a side dish. Both ways they’re good with meat, or as part of a spread of small plates like hummus and grated carrot salad. Remove the leaves if they are still attached, otherwise they’ll start to draw moisture away from the radish itself. You can use the leaves in salads and stir fries, so there’s no need to waste them.